Know all men by these presents, that we William K. Johnson, John Johnson & Joseph K. Johnson of the County of Coshocton and State of Ohio in consideration of the sum of three thousand six hundred Dollars in hand paid by Joseph Morrison of the county of Belmont & State of Ohio have bargained and sold and do hereby grant, bargain, sell and convey unto the said Joseph Morrison his heirs and assigns forever, the following premises situate in the County of Coshocton in the State of Ohio and bounded and described as follows being Lots ajoining [sic] the town plat of Coshocton numbers one two three four five nine ten eleven twelve & all that part of thirteen being South of the road containing in all forty eight acres Also Eighteen & three fourths acres in the South West corner of Section 1 of Township 5 in Range six being the same land conveyed by Benjamin Ricketts to James Renfrew by deed Dated March 13th 1823 Recorded in Coshocton County in Book 3 pages 406 & 406 also all the part of Lots 11 & 14 in the same section Township & Range lying between lands belonging to Morris Burk the road leading from Coshocton to Cadiz containing sixty acres To Have And To Hold said premises with the appurtenances unto the said Joseph Morrison his heirs and assigns forever Provided always these presents are upon this condition, that whereas said W. K. Johnson & Co. William Renfrew and Robert Hay hath executed to said Joseph Morrison their promissory note of even date herewith for the payment of the following sum of money at the time following Three thousand six hundred Dollars payable on the 9th day of August 1843 Now if the said William K. Johnson & Co. shall pay said sum of money to said Joseph Morrison or his assigns when the same respectively becomes due then these presents to be void; otherwise to be and remain in full force. In testimony whereof the William K. Johnson, John Johnson & Joseph K. Johnson have hereunto set their hands & seals this ninth day of August in the Anno Domini Eighteen hundred and forty two. State of Ohio, Coshocton County Before me Abm. 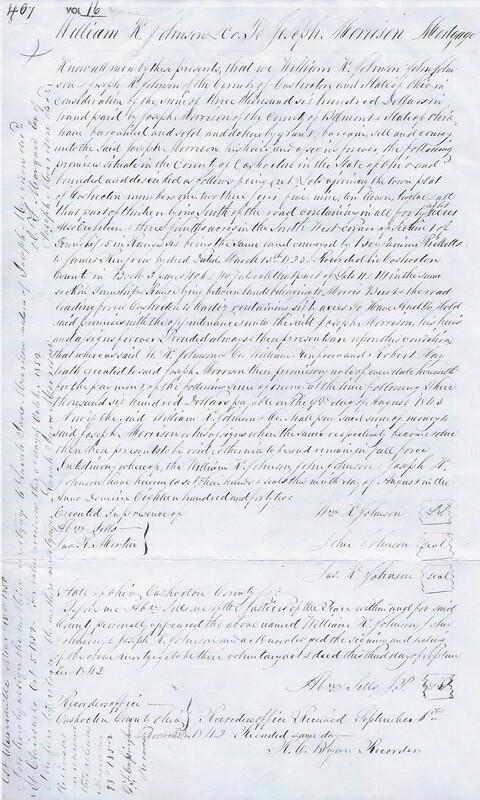 Sells one of the Justices of the Peace within and for the said County personally appeared the above named William K. Johnson, John Johnson & Joseph K. Johnson and acknowledged the signing and sealing of the above mortgage to be their voluntary act & deed this third day of September 1842. I do hereby assign the within mortgage to Sarah Jane Morrison widow of Joseph Morrison decd.